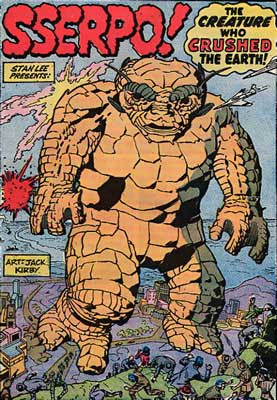 This is the first in a series of Spotlights on Atlas-Age Marvel Monsters. One hundred years ago, scientist Thomas Burke is hard at work in his lab, toiling away to perfect his growth serum. But try as he might, he can't discover the ultimate, final ingredient that's needed for his formula to become active. Finally, in frustration, he hurls the stoppered vial into the ocean, where it settles untouched on the bottom for decades. One hundred years later, a hungry sea-creature, of unknown species, comes across the bottle while out looking for food. It innocently opens the vial-- the contents of which mix with the sea water-- and drinks it down. Lord love a duck! How was Prof. Burke supposed to have known that the missing ingredient that had escaped him for so long was actually common, everyday water??? The poor little creature begins growing at a rapid rate He's soon discovered by some sea-going natives, who bring him ashore to their tropical island, and name him Sserpo. Soon enough though, little Sserpo has grown so large that his enormous bulk causes their island to sink beneath the ocean waves! 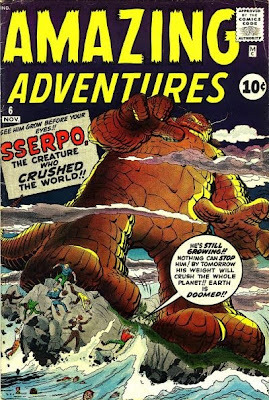 Heading back out to sea, Sserpo quickly grows to over 1,000 feet, and makes his way to Japan, where even nuclear weapons prove useless against him-- he's simply too large for them to be effective! Meanwhile, a modern day American scientist works feverishly to come up with some way to halt Sserpo's frenzied growth. At this point, the creature has become so large that he towers over entire continents, and if unstopped, he'll soon be so huge that his weight will throw the Earth off its axis, dooming the entire planet to destruction! I won't reveal how mankind finally thwarts Sserpo's untamed growth, but it does involve the planet Jupiter, and the darndest intergalactic contraption ever devised. And the shocking twist ending has to be read to be believed! 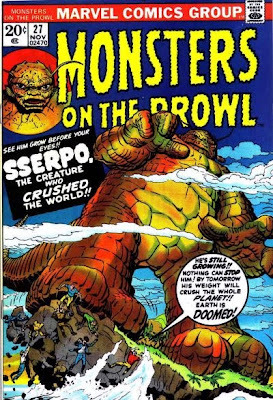 Truth is, I always felt a little sorry for ol' Sserpo. He was just a hungry little sea-creature of unknown species, looking for a quick meal. He certainly didn't mean to cause the human race so much grief. But such is life, I guess. Fare thee well, Sserpo... wherever you are. "Sserpo! The Creature That Crushed the Earth!" Images from the great Monster Blog and the Grand Comics Database. NEXT TIME: Groot, the Monster from Planet X!